Hey Heather — cool blog! And yes, gooo Steelers! 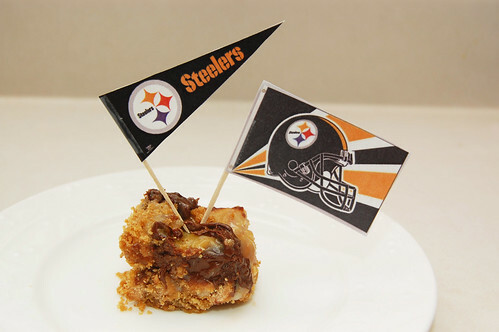 Did you hear about the Eat'n Park Steelers smiley cookies? My Pittsburgh aunt sent me a dozen in the mail yesterday with a terrible towel: http://www.eatnpark.com/newsDetail.asp?NewsID=190&NewsCategoryID;=2. Anyway, I'm going have to read this blog a lot more… yum yum! Sports Kate – Thank you! No, I hadn’t heard about the smiley cookies, but man do I miss Eat’n Park! I’ll have to check that site out – sounds great. The bars look delish! I could eat a whole pan, but I fear the hours I would need to spend on the elliptical paying for my binge. I could really go for an Eat’n Park hot turkey sandwich. Got my terrible towels ready. Come on Big Ben don’t let us in Findlay Ohio down. Well, umm… I ALMOST ate a whole pan once when Morgan was on a business trip in Savannah… so proceed with caution! At the grocery store last night Morgan suggested I make a “Pittsburgh salad” for the super bowl (the salad with french fries on it). Sunday better be a good day for them!